Five days ago, The Baltimore Sun reported another measles outbreak in Pikesville, just outside Baltimore, where many thousands of (orthodox) Jews live. In Israel, there have been multiple reports of the spread of measles. The Israeli Ministry of Health has now prohibited any unvaccinated child from entering kindergarten, and there is a report of an El-Al flight attendant who is critically ill after she caught measles on a flight from Israel to New York. Perhaps measles was brought to Israel from Uman in the Ukraine by Breslov Chassidim. Who knows? It goes on and on…. Two months ago we published an essay on vaccines and rabbinic responsibility in Lehrhaus. Sadly, it seems the right time to put it out again. Here it is. We are living in the midst of a wave of hysteria in which the need for childhood vaccinations is questioned or denied. This is not the first such wave. There have been cases of mass hysteria in virtually every country and every society, from Malaysia to Kosovo and London to Mexico City. In 1962 in Tanzania it was an outbreak of laughing; in 1983 in the West Bank it was an outbreak of fainting. In the late seventeenth century in colonial Massachusetts there were the Salem witch hunts; two-hundred people – the vast majority women - were accused of serving the devil. Before it was over, nineteen were hanged, and one was stoned to death. In the mid twentieth century a wave on anti-communist hysteria swept this country, culminating in the McCarthy Senate hearings. Like any complex sociological phenomenon, there are many factors that created what has become a de facto anti-vaccine movement. These include a perceived lack of the severity of the illness, fear of needles or the pain of vaccination, a distrust of the information produced by governments and a belief that vaccines are not effective or have dangerous side effects. Since it first began in the 1990s, it has swept across the US, Europe, and the Middle East. In France over 40% of the population believe that vaccines are not safe. A quarter of Greeks and Ukrainians are hostile. And characteristics of the deniers vary between countries: women in Hungary are more likely than males to believe that vaccines are effective, but in the Czech Republic, Germany, and Italy the reverse is true. Anti-vaccination hysteria is also present among a small but vocal number of orthodox Jews. Among the most widely reported anti-vaccination declarations is that of Rabbi Shmuel Kamenetzky, Rosh Yeshiva of the Talmudical Academy of Philadelphia. “I see vaccinations as the problem” said Rabbi Kamenetzky, who is a member of the Moetzes Gedolei HaTorah, the rabbinical board of Agudat Yisrael. “It’s a hoax. Even the Salk vaccine [against polio] is a hoax. It is just big business.” In November 2018 the Rosh Yeshiva’s wife, Temi, led a teleconference in which she compared the German company that produces the MMR vaccine to Amalek, the ancient foe of the Jewish people. An anonymous group in Lakewood has distributed an eighteen-page color brochure encouraging parents to refrain from vaccinating their children. More recently, and in a far more subtle and nuanced way, the Orthodox Union issued a hesitant statement about the importance of childhood vaccinations. We will return to that later. As a first step to combating this hysteria, rabbis of every synagogue and heads of every Jewish school must issue an unambiguous and unequivocal statement, declaring that only children who are vaccinated will be allowed to attend. These should be published immediately, since many families with young children travel to celebrate Passover. Lives depend on it. At the beginning of this century measles killed over 550,000 children worldwide. That number has dropped by 84%. In the US there were about 500 measles deaths each year before the introduction of the vaccine. There hasn’t been a reported death from the disease since 2015. But in 2018 almost every region in the world experienced an increase in cases of measles. In Europe the number of confirmed cases rose by over 60% compared with the previous year. In the US this year, the number of confirmed cases almost doubled; so far there have been 15 measles outbreaks. Parts of Seattle now have lower vaccination rates than Rwanda. In Europe measles killed at least 37 people in the first six month of this year. And in Israel the incidence of measles (per million population) increased from 1.3 to over 62, and the number of actual cases increased from 15 last year to at least 526 this year. This year in Jerusalem an unvaccinated toddler died of measles. Hers was the first measles death there in 15 years. Why is this happening? One clue is from a recently published paper from an Australian group which examined the psychological roots of anti-vaccination attitudes among over 5,000 respondents in twenty-four countries. Its results highlight the correlation between (among other things) conspiratorial thinking and holding an anti-vaccination position. Perhaps that is no surprise, but most alarming is the finding that levels of education had no such correlation. “The particularly strong role of conspiratorial beliefs” conclude the authors, “helps contextualize why corrective information and myth-busting about vaccinations has tended to be either ineffective or counterproductive.” It doesn’t matter what you say, what evidence you provide. Paradoxically, presenting facts to those who are anti-vaccine is actually counterproductive. Because it was never about the facts. As the statements of Rabbi Kamenetzky and her wife demonstrate, conspiratorial thinking also plays a significant role within the ultra-orthodox community. But research in Israel has shown that there are other factors at play. These include having more than six children, the mother’s level of education, a belief that Judaism forbids vaccination, a perception that the risk of vaccine preventable diseases is low, and mistrust of the health authorities. How are we to frame our thinking about this wave of anti-vaccine hysteria? How might we learn about a response from our rich Jewish intellectual heritage? Perhaps by turning to a small sefer written by a long-forgotten rabbi and published in London over two-hundred and thirty years ago. As Abraham ben Solomon noted, there were many physicians opposed to the procedure. It’s not hard to understand why. Neither Jenner nor anyone else had any idea what caused smallpox or why the vaccine worked. Parents were being asked to allow their healthy child to be deliberately inoculated with the pus of smallpox victim. It was a leap of faith that I imagine many of us would have refused to take. And among Jews there was the question of whether Jewish law permitted it at all. The second reason for publishing without an approbation was this: Abraham was not interested in making money from his book. He believed that rabbinic haskamot usually served only to remind others of the issues of copyright. But Abraham never intended for his book to be a commercial success. “I give full permission” he wrote, “to whomever wishes, to publish this book at the end of the year 5545 ” – the very year in which the book was published. The goal was not sales: it was saving lives. Abraham’s book was meant to persuade his readers that although inoculation carried a small risk, it was a far better option than opening up the possibility of catching smallpox. Writing before an understanding of the germ theory of disease, he cited the opinion of a Jewish physician by the name of Jacob Zahalon of Rome who identified impure menstrual blood as the cause of smallpox. Zahalon was of course wrong – but no more wrong that anyone else, writing some two centuries before Pasteur’s experiments which demonstrated the correctness of the germ theory. But it didn’t much matter what caused smallpox; what mattered was the success of the vaccination program. Abraham focused on the issue of doubt and certainty and cases where there may be an element of tiny risk (ספק ספקה). He cited the Talmud (Chullin 9), the Shulchan Aruch and its commentaries, (Yoreh De’ah 110), and examples from Torah, Nevi’im and Ketuvim. He was working, he acknowledged, in uncharted territory; inoculation had not previously been discussed anywhere in the responsa literature. There was no precedent to be found in the Talmud or the Gaonim, but basing himself on what sources might have been germane, he ruled that any healthy child who had not yet caught smallpox was to be considered already sick. Halakha therefore required that the vaccine be given, even if it carried, as it did, a risk of serious complications and even death. After considering all of this, I sit in judgement before my teachers and rabbis who are expert adjudicators. In my humble opinion this medical intervention has been proved effective and is now widely used. There were four arguments in support of vaccination in Oleh Terufah, First, experience had already demonstrated that the vaccine worked. Second, it was important to act quickly to save the lives of children. Third, any medical procedure carries risk, but the risk specific to vaccination was no greater than that associated with other widely accepted therapies of the time. Vaccines today pose nothing of the risk that Abraham was discussing of course. They are medicines, so of course they have side effects. The most common of these are allergic reactions, and there is no link whatsoever between vaccination and autism. Finally, Abraham wrote of the deaths of two of his four children from smallpox to emphasize the risks of not vaccinating. He made his story personal. But it was the fact that he took a position at all that makes Abraham’s book so worthy of study. It was an example of leadership at a time of crisis. Which brings us to the Orthodox Union. Anyone with a modicum of scientific background would know that herd immunity is as real as innate immunity or acquired immunity. It is not an object but a concept, and one that carries a great deal of importance in our fight against devastating infectious diseases. Herd (or group) immunity occurs when a sufficiently large number of members develop immunity to an infectious disease, due either to vaccinations or the development of natural immunity after an infection. In this setting, a bacteria or virus has so few hosts that it fails to penetrate the group that its ability to infect non-immune members is drastically reduced. The presence of immune individuals provides indirect protection to the non-immune. But the OU-RCA statement questions the very existence of herd immunity. If indeed, as the OU-RCA statement claims, “Jewish law defers to the consensus of medical experts” why does it suggest a paragraph later that “everyone should consult with his or her religious, medical and legal advisors in determining what actions to take”? What role might these religious leaders have, if we were just told that Jewish law should defer to medical opinion? Why the need to include this disclaimer at all? Abraham argued in his book that Jewish law required every parent to vaccinate their child. The OU could have looked to earlier works – like Oleh Terufah - for a model of rabbinic responsibility. The OU statement prevaricated when it should have been crystal clear. The Talmud relates that Resh Lakish, the great amora of the third century, and his secretary Yehuda bar Nachmeni went to comfort Rav Chiyyah bar Abba, who was mourning the death of his child. Yehudah bar Nachmeni offered some intended words of comfort, but they were nothing of the sort; they were words of rebuke. “In a generation in which fathers abhor the Holy One, Blessed be He, He gets angry at their sons and their daughters, and they die when they are young.” Resh Lakish, hearing Yehuda’s insensitivity told him to change track. Here is the last of the four blessings with which Yehuda replied. Master of the worlds, redeem and save, deliver and help your nation Israel from pestilence, and from the sword, and from plundering, from the plagues of wind blast and mildew [that destroy the crops], and from all types of misfortunes that may break out and come into the world. Before we call, you answer. Blessed are You, who ends the plague. Blessed are You who ends the plague. All that could be done when little children died was to pray for God to intervene and end the plague. It’s an understandable response to the tragedy caused by infectious disease, when all you can do is watch the children die. A quite different blessing is made before undergoing a medical procedure. It was originally said prior to bloodletting (now mercifully a thing of the past). But it should be said by any patient before and after undergoing any medical intervention, and it is (or should be) part of normative Jewish practice to this day, as ruled by the Shulchan Aruch. May it be your will Lord my God, that this procedure will heal me, for you are an unconditional healer. And when it is finished, he says: Blessed are you God, healer of the sick. In the fight against infectious diseases, we now have more than just the option of praying for a plague to end. We can vaccinate our children and offer a prayer to God asking that that the vaccine perform its job. That is the message we need to tell, in every shul, in every Jewish day school, and in every religious organization in the country. Robert Batholomew and Bob Rickard Mass Hysteria in Schools. Jefferson, North Carolina, McFarland & Company 2014. Jess Blumberg, "A Brief History of the Salem Witch Trials." Richard M. Fried Nightmare in Red: The Mccarthy Era in Perspective. New York ; Oxford, Oxford University Press 1990. For some preliminary results see S. Blume "Anti-Vaccination Movements and Their Interpretations," Social Science & Medicine 2006; 62: 628–642. O. Yaqub et al. 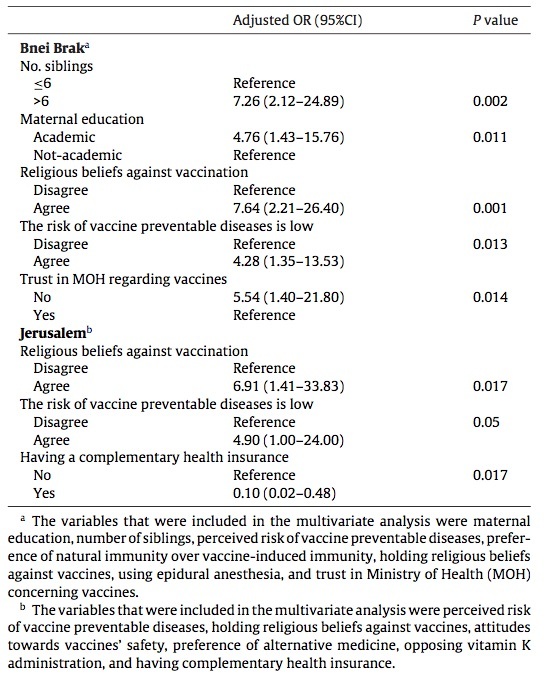 "Attitudes to Vaccination: A Critical Review," Social Science & Medicine 2014;112; 1-11. Anti-vax fears drive a measles outbreak in Europe. The Economist, August 25, 2018. H Larson et al., "State of Vaccine Confidence in the EU 2018," (Luxembourg: European Commission, Directorate General for Health and Food Safety, 2018). Simone Ellen. A Healthy Dose? Baltimore Jewish Times August 28, 2014. Ellen’s article appears to have been the source for this quote which was widely circulated on websites for religious Jews. A recording is available here. “Is this being recorded?” asks one of the women on the phone. “I hope not, replied” the rebbetzin. Among the many other baseless claims she makes there is this one: a pharmaceutical company was behind the murder of a doctor who had developed a cure for cancer. The only exception is when vaccinations is the rare instance in which they may be medically contraindicated. In some of these are: a history of anaphylaxis on prior immunization, and immune suppression. Pregnant women should not receive the following vaccines: HPV, MMR varicella and zoster. For a full list of contraindications see the CDC here. Centers for Disease Control, Measles Data and Statistics. WHO Reported Measles. World Health Organization, "Reported Measles Cases by Who Region, 2017, 2018." World Health Organization, 2018. World Health Organization, "Epidata," (2018); ibid. Z. Horne et al. "Countering Antivaccination Attitudes," Proc Natl Acad Sci U S A 112, no. 33 (2015) ; Muhsen et al., "Risk Factors of Underutilization of Childhood Immunizations in Ultra-orthodox Jewish Communities in Israel Despite High Access to Health Care Services," But showing them examples of how the disease looks in children, preferentially with pictures does more. Muhsen et al., "Risk Factors of Underutilization of Childhood Immunizations in Ultraorthodox Jewish Communities in Israel Despite High Access to Health Care Services." Vaccine, 30 (12); 2109-2115. Abraham ben Solomon Oleh Terufah. London, Alexander bar Yehudah 1785. David B. Ruderman "Some Jewish Responses to Smallpox Prevention in the Late Eighteenth and Early Nineteenth Centuries: A New Perspective on the Modernization of European Jewry," Aleph 2 (2002). Ruderman provides the background and social context of Oleh Terufah. C. P. Gross and K. A. Sepkowitz "The Myth of the Medical Breakthrough: Smallpox, Vaccination, and Jenner Reconsidered," Int J Infect Dis 3, no. 1 (1998). Edward Jenner. An Inquiry into the Causes and Effects of the Variolae Vaccinae, a Disease Discovered in Some of the Western Counties of England, Particularly Gloucestershire, and Known by the Name the Cow Pox. London, Sampson Low 1798. Abraham put the mortality risk from inoculation at one in one thousand. This was certainly a guess, meant to describe an extremely low risk rather than an actual complication rate. Abraham had published an essay on Ha-Meassef a year earlier in which he covered much the same ground. There he estimated the mortality rate at 5/60,000. See Ha-Meassef Tishrei 5545 (1784) section Letters section II 5-15. Because Jenner also had no idea why inoculation worked, his discovery did not really advance the science. See David Wootton Bad Medicine: Doctors Doing Harm since Hippocrates. Oxford; New York, Oxford University Press 2006. Among the earliest teshuvot are Teshuva Me’Ahava (Rabbi Eleazar ben David Fleckeles) vol 1, #135 dated 1805. He permitted a child to be inoculated on Shabbat itself, if there was no alternative day available. See Talmudology. Bloodletting and laxatives were among the only interventions the physicians could offer, and they did so for a huge number of conditions. Remarkably, both were used as late as 1918 to treat influenza. See Jeremy Brown Influenza: The Hundred Year Hunt to Cure the Deadliest Disease in History. New York, Touchstone 2018. Agudas Yisrael issued a statement on vaccinations that can be found here. The term appears to have been first used in 1923 to describe “immunity as an attribute of a herd…closely related to, but in many ways distinct from, the problem of the immunity of an individual host.” See Topley, W. W. C.; Wilson, G. S. "The Spread of Bacterial Infection. The Problem of Herd-Immunity". The Journal of Hygiene 1923: 21 (3); 243–249. The term had been used in a slightly different context as early as 1918. It’s not as if the OU is afraid to take a stand on controversial issues. Last year it published its position on whether a woman may be employed in a clergy function. It did so because the OU leadership felt that orthodox community “would benefit greatly by receiving comprehensive, fully elucidated responses regarding women’s professional roles that would inform and educate our increasingly sophisticated community membership.” It was a tightly worded and heavily referenced paper of almost 7,000 words, and concluded that there was “a legal preclusion to the appointment of women clergy.” There was no such prevarication or disclaimer on the clergy issue. On that there appeared to be no room for religious dissent. The OU statement on vaccinations was twenty times shorter, with not a single reference or declarative statement. Instead it ended with another prevarication, reminding the reader that before deciding in a course of action they should “consult with …religious, medical, and legal advisors.” Somehow, the anti-vaccine hysteria managed to enter a statement that called for more parents to vaccinate. For a review of vaccination in halacha see Asher Bush, “Vaccination in Halakhah and in Practice in the Orthodox Jewish Community” Hakirah 2012 (13):185-212. 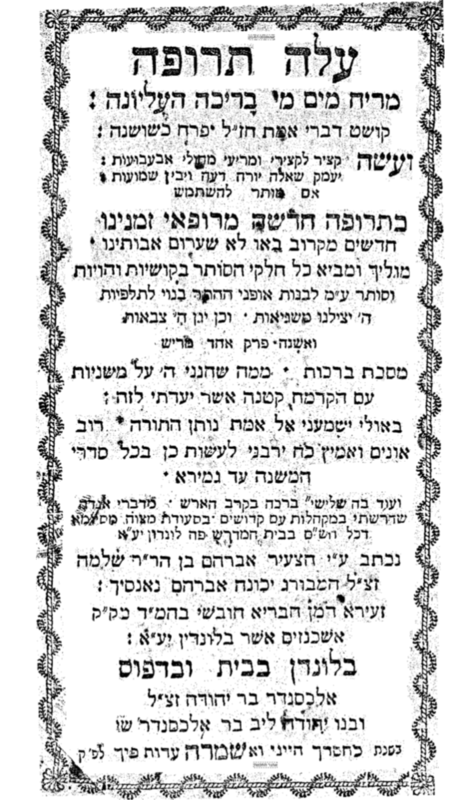 In today's Daf Yomi, the secretary of Resh Lakish, a man by called Yehuda bar Nachmani, offers four blessings that may be said as part of the meal eaten at a house of mourning. Although the fourth blessing, "Who ends the plague" (עוצר המגפה) is not said usually today, we do have a tradition of giving thanks when a plague comes to an end. Like all epidemics, cholera flares up and then disappears, even when no effective medical interventions are available. It was when one of these devastating outbreaks of cholera had ended, that the Jews of London came together to do what Resh Lakish described. On Nov 1, 1850, they offered a prayer of thanks at the cessation of the plague of cholera. — Service of Thanksgiving on the Cessation of the Cholera, London, Nov 1850. [I]t's possible that the V. Cholerae's dramatic reproductive success...had been the agent of its own demise...it quickly burned through its primary fuel supply. There weren't enough small intestines to colonize....It's also possible that the Vibrio cholerae had not been able to survive more than a few days in the well water... With no sunlight penetrating the well, the water would have been free of plankton, and so the bacteria that didn't escape might have slowly starved to death in the the dark, twenty feet below street level...But the most likely scenario is that the bacterium was itself in a life-or-death struggle with another organism: a viral phage that exploits V. cholerae for its own reproductive ends the way V. cholerae exploits the human small intestine. One phage injected into a bacterial cell yields about a hundred new viral particles, and kills the bacterium in the process. After several days of that replication, the population of V. cholerae might have been replaced by phages that were harmless to humans. (Steven Johnson, The Ghost Map, 152). But this explanation lessens not one bit the religious impulse to give thanks. In West Africa, the Ebola epidemic is slowly ending. Although there is neither an effective vaccine to prevent Ebola, nor an effective anti-viral to treat it, public health interventions have paid off, and life is slowly returning to normal. In today's daf, the secretary of Resh Lakish offered a Prayer of Thanks when a plague ended. But precisely when did he say these words? At a funeral. The funeral of a young child (ינוקא). The secretary of Resh Lakish offered these words of thanks at a child's funeral, and directed them towards "all Israel" (כנגד כל ישראל), that is, towards the survivors. How ironic it is that it is the children who are most at risk in this measles epidemic. And how tragic that they face the complications of this illness (including pneumonia, diarrhea, encephalitis, subacute sclerosing pan-encephalitis, and death,) because of the reckless behavior of their parents.